Winter time in Churchill, Manitoba is extremely cold and the plumage of the Ptarmigan changes to white. As seasons change, so does the plumage of a Ptarmigan therefore always being camouflaged from any enemies. Their feathers moult from white in the winter and then brown in the spring or summer. The Ptarmigan resides on rocky mountainsides or tundra in the cold arctic regions. 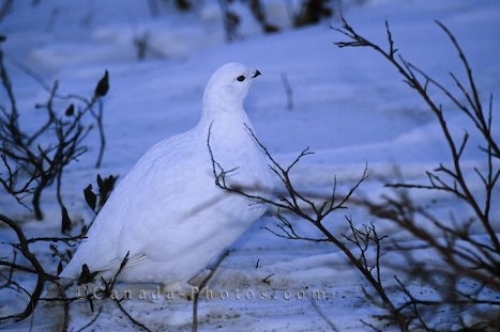 Picture of a Ptarmigan in the winter in Churchill, Manitoba in Canada.